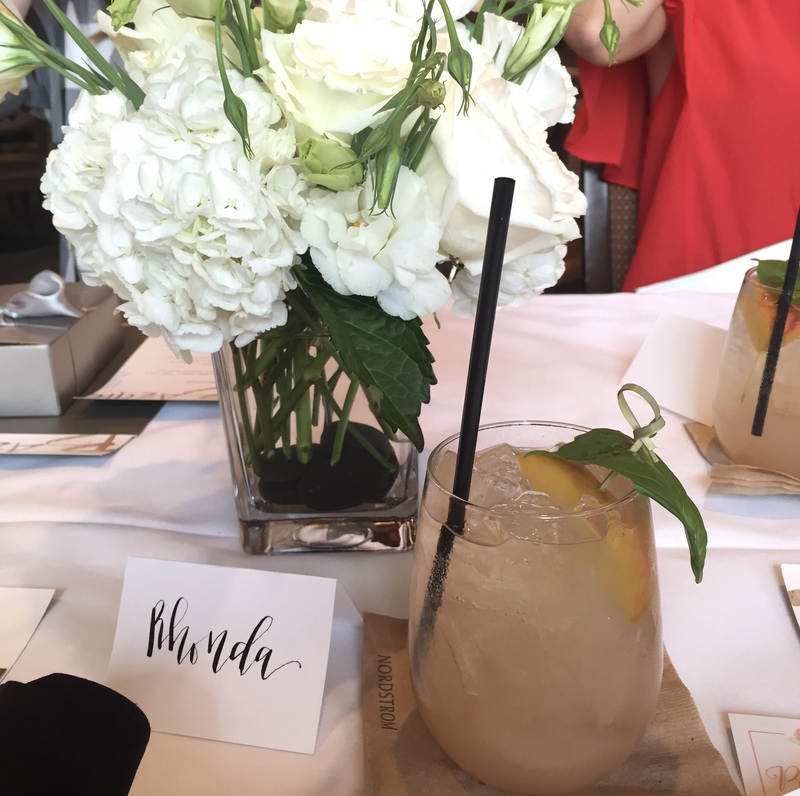 This month we had a very special #DallasBloggerBrunch, hosted by Nordstrom! (Read about the very first #DallasBloggerBrunch at Sissy's Southern Kitchen, or other past brunches at Smoke, Parigi, Henry's Majestic and more!) If you live in Dallas, you know that Northpark Mall is THE place to shop and Nordstrom is my favorite retailer in the mall- it's a one stop shop! Well, you might not know that Nordstrom has a full-service restaurant and bar on the third floor called Bazille (previously Bistro N), which is where we enjoyed brunch on Saturday. Planning the florals and settings is one of my favorite parts of brunch each month- I love flowers! This month, Raquel from R Love Floral came up with these beautiful and fresh white arrangements for the table. Our placecards were done by Clara Doyle Designs; classic black and white was perfect for an elegant Nordstrom brunch. Pictured below is Bazille's Peach Bellini, which was so refreshing! Then we tried their famous White Chocolate Raspberry Bread Pudding. Omg. Go get a piece right now. It was that good- warm and fluffy with just the right amount of sweet. Dessert perfection. I think I might have missed my calling and should become a food blogger…maybe one day. This month's brunch was so enjoyable because of the ladies who attended- I love having a community of bloggers in Dallas who are excited about meeting new friends and encouraging each other. Thank you to Nordstrom for hosting this month's #dallasbloggerbrunch!